The following practices allow the team to work on and improve various tactical postures. 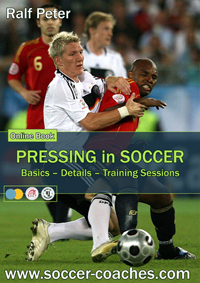 At first, we are interested that the coach is able to systematically and in small groups improve various elements of pressing, such as double-teaming, approach-runs, pressuring, and channeling. The following practice examples simulate real game situations as they include “active” opponents and take place in realistic playing areas, just like on the real field. In the second part, there will be practices with details of pressing but without the real-game conditions of part one. To improve the defensive approach run, the challenge/pressure, and the channeling to the inside as well as double-teaming in central areas. After winning the ball, they attack the large goal involving all their players, resulting in a 4 v 3 for this group with the ball. How to get easy Animation – the software for soccer animations. Objective: Practicing double-teaming in a central area. Playing area is the “double penalty box”. Possibly smaller depending on the players’ level; 2 teams; 2 regulation-size goals; 2 yellow, 2 red, 2 orange, and 2 blue cones on the sides for orientation. The players at the yellow cone pass to their team-mates in the area. The two defenders try to win the ball by double-teaming. -After winning the ball, they finish with a shot on goal. After the pass, the server (passing is a must!) can get involved and help his team-mate. Joint double-teaming by #6 and #10 is being practiced here. Also, the defensive behavior on the part of the outside midfielder in pressing situations is also schooled.